The endless choices confronting a translator constitute a great deal of creative freedom. Our latest issue features three poems by the Uyghur writer Tahir Hamut. Here, the Asymptote Interview Features Editor Ryan Mihaly talks to the translator, Joshua Freeman. 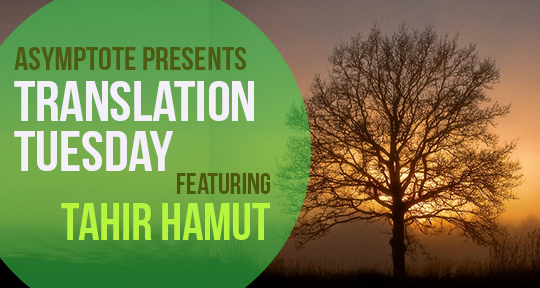 When we first spoke in October 2015, you mentioned your excitement about translating Tahir Hamut. It’s wonderful to see these poems now. How long have you been working with Hamut? Have you worked with him on translation issues? Tahir Hamut was actually one of the first poets I translated, almost ten years ago. I met him soon after I started translating his work, since I was also living in Ürümchi, capital of China’s Xinjiang Uyghur Autonomous Region, at the time. He’s a terrific conversationalist with wide-ranging interests, and I’ve enjoyed exchanging ideas with him on all manner of subjects over the years. I used to ask him occasionally why he didn’t write much poetry anymore, since I regard him as one of the most talented living poets writing in Uyghur. (His poem “Returning to Kashgar” is perhaps my favorite.) Over the last couple years it’s been exciting for me that he’s suddenly reemerged with a torrent of new work, every bit as good as his work from the nineties. When I translate work by a living poet—and most poets I translate are still around—I usually produce a semi-final draft of my translation, and then get in touch with the poet about any lingering questions of meaning or interpretation. Those conversations can be quite lengthy, and in fact I really enjoy them; as a non-poet myself, it’s a unique chance to have some access to the literary thought processes of poets I admire. Speaking with Tahir about his work, we’ll sometimes slip briefly from Uyghur into Chinese to discuss a word or a line from the “meta” level of a second language. Interesting that you call yourself a non-poet. I wonder if you are of the camp that considers a translated poem a new poem all its own? Or do you think it is strictly a translation?